CBI - China: Day 25 of 41 of the 1st Battle of Shanghai. CBI - China: Day 52 of 142 of the 1st Battle of Hebei. CBI - China: Day 1 of 9 of the Battle of Rehe. Spain: Day 220 of 985 of the Spanish Civil War. Spain: Day 585 of 985 of the Spanish Civil War. CBI - China: Day 230 of 2,987 of the 2nd Sino-Japanese War. Day 15 of 124 of the Battle of Henan. Germany: The Decree concerning the Surrender of Precious Metals and Stones in Jewish Ownership is enacted, requiring all Jews to surrender their gold, silver, diamonds and other valuables to the state without any compensation. 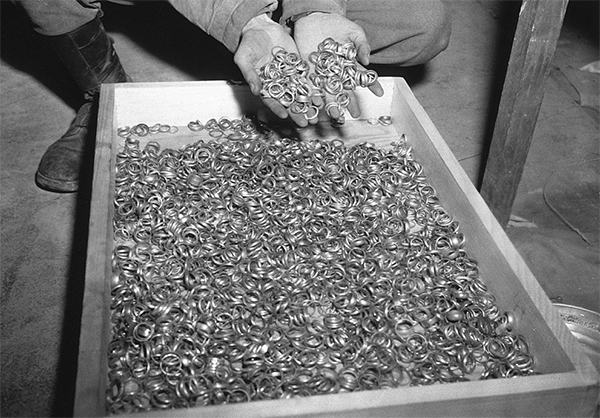 A US soldier inspects thousands of gold wedding bands taken from Jews by the Germans and stashed in the Heilbronn Salt Mines, Germany. Spain: Day 950 of 985 of the Spanish Civil War. CBI - China: Day 595 of 2,987 of the 2nd Sino-Japanese War. Finland: Day 84 of 105 of the Russo-Finnish War. CBI - China: Day 960 of 2,987 of the 2nd Sino-Japanese War. Day 99 of 381 of the Battle of South Guangxi. Day 25 of 67 of the Battle of Wuyuan. ETO - UK: Day 169 of 258 of the Blitz. East Africa: Day 257 of 537 of Italy's East African campaign in the lands south of Egypt. East Africa - Eritrea: Day 17 of 56 of the Battle of Keren. CBI - China: Day 1,326 of 2,987 of the 2nd Sino-Japanese War. Day 23 of 31 of the Battle of South Henan. CBI - Thailand: Day 144 of 221 of the Franco-Thai War (Vichy France vs Thailand). Atlantic: Day 39 of 169 of Germany's Second "Happy Time," during which U-boats sink 609 Allied ships with little risk. Russian Front - North: Day 167 of 872 of the Siege of Leningrad. Russian Front - North: Day 14 of 102 of the Battle of the Demyansk Pocket, another failed attempt to break the siege at Leningrad. Russian Front - North: Day 30 of 103 of the Battle of the Kholm Pocket. Another attempt to break the siege at Leningrad. Russian Front - Center: Day 45 of 103 of the Battle of Vyazma, Russia. Russian Front - Center: Day 45 of 103 of the Battle of Sychevsk, Russia. Russian Front - South: Day 115 of 248 of the Siege of Sevastopol, Crimean Peninsula. All German attacks against Sevastopol are stopped for the winter. CBI - Burma: Day 70 of 164 of Japan's Invasion of Burma. CBI - Burma: Day 3 of 5 of the Battle of Sittang Bridge. British troops continue to withdraw across the river Sittang. CBI - China: Day 1,691 of 2,987 of the 2nd Sino-Japanese War. Day 60 of 99 of the 3rd Battle of Changsha. PTO - Borneo: Day 68 of 107 of the Battle of Borneo. PTO - Dutch East Indies: The US 5th Air Force and other US troops begin preparing to evacuate from Java. PTO - Malaya: Day 3 of 357 of the Battle of Timor Island. PTO - Philippines: Day 76 of 152 of the 1st Battle of the Philippines. 5th Air Force provides air support. Atlantic: A 60-ship convoy sailing from Britain to North America is attacked by 19 U-boats. 14 Allied ships and 4 U-boats are sunk. USSR: The 25th Anniversary of the creation of the Red Army is celebrated in all Soviet countries. Russian Front - North: Day 532 of 872 of the Siege of Leningrad. Russian Front - North: Day 12 of 51 of the USSR's Operation POLAR STAR, a failed offensive north of Leningrad, hoping to take the southern shore of Lake Ladoga, Russia. Russian Front - North: Day 293 of 658 of the Siege of the Kholm Pocket, USSR lays siege to the Kholm Pocket but the Germans hold out for a about a year and a half. Russian Front - South: Day 3 of 25 of the 3rd Battle of Kharkov, Ukraine. USSR briefly takes and holds Kharkov, but will lose it again. MTO - Tunisia: Day 97 of 178 of the Battle of Tunisia. MTO - Tunisia: Day 3 of 7 of the Battle of Kasserine Pass. CBI - Burma: Day 63 of 104 of the 1st Battle of Arakan. US 10th Air Force provides air support. CBI - Burma: Day 14 of 79 of the Allied Operation LONGCLOTH. CBI - China: Day 2,056 of 2,987 of the 2nd Sino-Japanese War. PTO - Alaska: Day 260 of 435 of the Battle of Kiska, Aleutian Islands. PTO - Solomon Islands: US 13th Air Force, USN, USMC and Royal New Zealand Air Force fighters provide air support for three beach landings in the Russell Islands, 30 miles northwest of Guadalcanal. ETO - Germany: Day 2 of 6 of Operation ARGUMENT, aka BIG WEEK, the US Strategic Air Forces' push to lure the Luftwaffe as heavy bombers attack key targets. Three areas in Germany are targeted today with the loss of 16 bombers and 5 fighters. ETO - Belgium: US 9th Air Force B-26s bomb the Coxyde Airfield. Russian Front - North: Day 658 of 658 of the Siege of the Kholm Pocket. The Germans finally decide to get out of this area. Russian Front - North: Day 39 of 48 of the Battle toward the Narva River, Estonia. This drive helped lift the Leningrad siege and goes on to liberate Narva. Russian Front - North: Day 20 of 191 of the Battle of the Narva Isthmus, Estonia. Russian Front - South: Day 60 of 113 of the USSR's Dnieper-Carpathian Offensive in southwestern Ukraine. Russian Front - South: Day 23 of 31 of the Battle of Nikopol, Ukraine. MTO - Italy: Day 36 of 123 of the Battle of Monte Cassino. RAF and US Air Forces provides air support for the Allied ground troops. MTO - Italy: Day 31 of 136 of the Battle of Anzio. RAF and US Air Forces provides air support for the Allied ground troops. CBI - Burma: Day 54 of 99 of the 2nd Battle of Arakan. CBI - Burma: Day 17 of 19 of the Battle of the Admin Box. US 10th Air Force provides air support. CBI - China: Day 2,421 of 2,987 of the 2nd Sino-Japanese War. PTO - Marshall Islands: Day 6 of 8 of the Battle of Eniwetok. US 7th Air Force provides air support. US Marines capture Eniwetok, suffering 339 dead, but it will take two more days to mop up the resistance. PTO - New Guinea: Day 156 of 219 of the Battle of Shaggy Ridge. 5th Air Force provides air support. PTO - New Guinea: Day 153 of 162 of the Battle of the Huon Peninsula. 5th Air Force provides air support. PTO - New Guinea: Day 69 of 597 of the Battle of New Britain. US 13th Air Force provides air support. PTO - Solomon Islands: Day 113 of 295 of the Battle of the Bougainville Islands. US 13th Air Force provides air support. ETO - France: Day 205 of 284 of the Battle of Brittany. ETO - France: Day 160 of 236 of the Siege of Dunkirk. ETO - Germany: Day 14 of 16 of Operation GRENADE, the US drive into Germany. US 9th Air Force provides air support. ETO - Germany: Day 14 of 17 of Operation VERITABLE, the British and Canadian drive into Germany. ETO: Day 33 of 66 of the Battle to the Rhine. US 9th Air Force provides air support. ETO - Germany: Day 2 of 36 consecutive RAF night raids on Berlin. ETO - Germany: US 8th Air Force B-17s day bomb at Nurnberg. At night the B-24s bomb the power and gas stations at Duisburg. Russian Front - Finland: Day 160 of 223 of the Lapland War. Finland and Russia have joined forces to kick the Germans out of Finland's most northern province. Russian Front - Center: Day 130 of 206 of the Battle of the Courland Pocket in Latvia. Russian Front - Center: Day 28 of 75 of the Battle of Königsberg, East Prussia (now Kaliningrad, Russia). Russian Front - Center: Day 27 of 63 of the Battle of the Heiligenbeil Pocket in East Prussia. Russian Front - Center: Day 12 of 54 of the Battle of East Pomerania, Germany. Russian Front - Center: Day 14 of 17 of the USSR's Lower Silesian Offensive (Poland). The Soviets capture the border town of Guben. Russian Front - Center: Day 9 of 83 of the German Siege of Breslau (today Wroclaw, Poland). Russian Front - Center: Day 21 of 31 of the Battle of Schwedt, Germany. MTO: US 15th Air Force B-17s and B-24s bomb targets in Austria, Hungary, and Italy. CBI - Burma: Day 34 of 61 of the Battles of Meiktila and Mandalay. The US 10th Air Force provides air support. CBI - Burma: Day 32 of 39 of the Battle of Ramree Island. The US 10th Air Force provides air support. British 36th Division breaks through at Myitson. CBI - Burma: Day 18 of 99 of the Battle of Pakokku and Irrawaddy River operations in central Burma. The US 10th Air Force provides air support. British 2nd Division establishes another Irrawaddy bridgehead. CBI - China: Day 2,787 of 2,987 of the 2nd Sino-Japanese War. US 14th Air Force attacks targets throughout southern and eastern China. PTO: Day 3 of 36 of the Battle of Iwo Jima. US 7th Air Force provides air support. PTO: US 7th Air Force attacks Pagan Island, Moen Island, Falas Island and Marcus Island. PTO - New Guinea: Day 422 of 597 of the Battle of New Britain. PTO - New Guinea: Day 306 of 481 of the Battle of Western New Guinea. PTO - Philippines: Day 125 of 299 of the 2nd Battle of the Philippines, aka the Liberation of the Philippines or the Philippines Campaign. PTO - Philippines: Day 69 of 244 of the Battle of Luzon. 5th Air Force provides air support. PTO - Philippines: Day 22 of 22 of the Battle of the Bataan Peninsula. 5th Air Force provides air support. US troops have secured the entire the Bataan Peninsula. PTO - Philippines: Day 19 of 29 of the Battle of Manila.